DA Form 4359 or the "Authorization For Psychiatric Service Treatment" is a Department of the Army-issued form used by and within the United States Military. The form - often incorrectly referred to as the DD form 4359 - was last revised on February 1, 2003. Download an up-to-date fillable DA Form 4359 down below in PDF-format or look it up on the Army Publishing Directorate website. 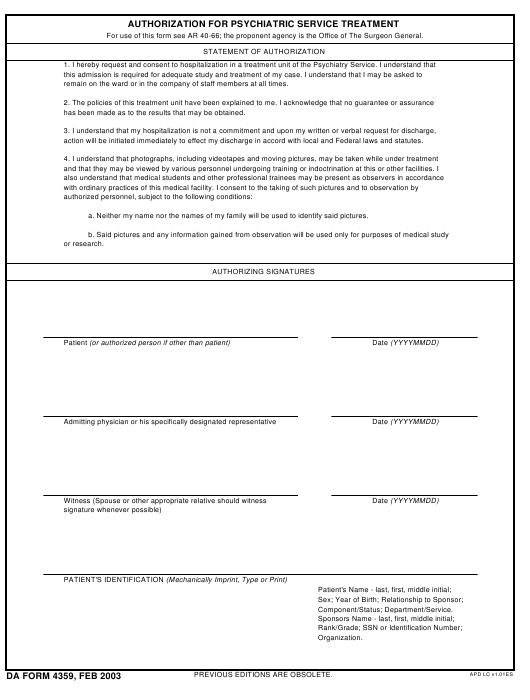 For use of this form see AR 40-66; the proponent agency is the Office of The Surgeon General. remain on the ward or in the company of staff members at all times. has been made as to the results that may be obtained. action will be initiated immediately to effect my discharge in accord with local and Federal laws and statutes. a. Neither my name nor the names of my family will be used to identify said pictures.